Audio Video› Can a Cat6 connector work on a Cat5e cable? If you’ve been running Ethernet cable or making patch cables for any length of time, you now have an assortment of RJ45 connectors and cable types representing the evolution of your network. You may be tempted to use what you have on hand to do your work, mixing and matching a bit. Visions haunt you of hunting through the cable jungle only to find that it was one of your cables that came loose, cable from connector, or even worse — looks just fine, but really isn’t making reliable contact. But is that just unnecessary worry? It Just Might (Reliably) Work! If you’re using Cat5e cable and all you have is newer Cat6 connectors, you may be all right. Generally, connectors may be backwards compatible with cable from older standards, but the reverse is not true — if you’re pulling Cat6 cable, time to update your Cat5e and older connector collection! There are some things to consider in proving that you’re using a workable combination of cable and connector, including a simple friction pull-test, cable and connector measurements, conductor fit and contact quality. There’s also the question of whether you’re already playing the odds with your cable quality. This is a simple test that determines whether the diameter of the cable is in the range which works with the Cat6 connector. This test ensures that the primary latch takes the strain of cable pull, rather than the conductors. Some Cat5e cables won’t be big enough for the latch to grab. Cat6 connectors are designed to accommodate much larger cable diameters than Cat5e, so most cables should fit — but check the numbers. 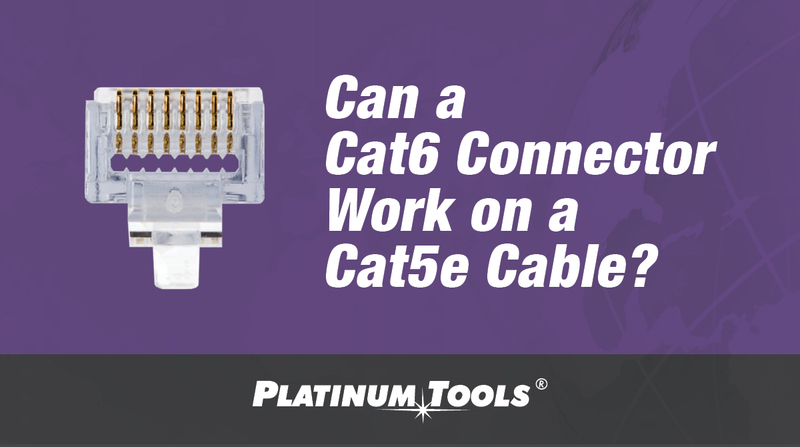 For example, Cat6 EZ-RJ45 connectors from Platinum Tools use 0.275 inches as a maximum cable OD, which is plenty for a typical 0.205 diameter Cat5e cable. For these EZ-RJ45 connectors, individual insulated conductors must also be 0.041 inches or less to fit through the connector. Cat6 connectors are designed for 24 and 23 AWG conductor wire sizes, and less can be problematic. Most 24 AWG Cat5e cable should measure up, but depending on the source it sometimes it doesn’t, as mentioned below. Conductor size determines whether the connection is going to be reliable or not. Although Cat6 solid conductor cables usually contain 23 AWG wire, Cat5e cables with 24 AWG conductors should seat and connect properly in the Cat6 connector. Conductors on the small side which worked for Cat5e may float or shift in the connector channels. This can cause problems ranging from an obvious open circuit to failure during certification. Ongoing issues from unreliable and incomplete surface contact may also occur. Where Did You Get That Cable? The volume of cable that installations use can tempt the use of questionable cable, often unknowingly. Purchasing can find a great price that appears to meet specs, but fails in the field. Cable such as “offshore deals” (some have other, more colorful names for it) can have marginal performance and quality. Marginal wire sizes, in particular, can produce intermittent or failed conductivity in Cat6 connectors, and PoE heat problems. Once you do your homework, using those spools of Cat5e cable with new Cat6 connectors is a pretty safe way to keep moving forward with your network installations. Remember to check that the strain relief is from crimping the cable jacket, protecting the conductors, and that your conductors are seating securely in their channels for reliable connections at any speed, and in any rated conditions!